Lawmakers in California are considering a measure that would prohibit the display of marijuana on state billboards along stretches of highway. As it now stands, there are a number of billboards that promote a variety of substances, from liquor to prescription medications – and yes, marijuana. But the marijuana industry is the only one being targeted by this effort. According to the Sacramento Bee, Assembly Bill 64 would result in an amendment to the recently-passed Proposition 64, the state’s recreational marijuana bill, by implementing tighter restrictions for advertising of marijuana and related products. Proposition 64 allows anyone over the age of 21 to possess up to one ounce of marijuana and it also creates a framework for sales of recreational weed that will go into effect the first of 2018. The measure also prohibited advertisements of recreational marijuana along the interstate highways that cross the border into California. However, what it did not do was ban advertising of marijuana on any interstate or state highway. That’s what Assembly Bill 64 would do. In the last 12 months, there have been pot billboards cropping up all over the state. There is one on Interstate 880, which advertises marijuana chocolates. here in South California, there is the “Buy Marijuana Legally” billboard in Santa Ana on the 55 freeway, ushering passersby to a cannabis club in Orange County. The new bill is supported by lawmakers on both sides who say it’s important to shield minors from pro-marijuana messages. They maintain this position even though the target audience here is comprised of people with a doctor’s recommendation for medicinal cannabis or adults seeking marijuana for recreation. 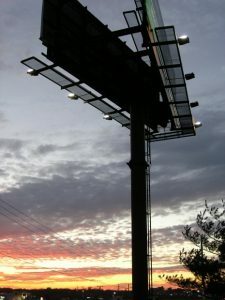 Proponents of the bill say those audiences can be reached without the use of billboards, which are seen by occupants in passing school buses, family vehicles and carpools. Another concern cited was that some businesses were posting these large, highly visible ads when they weren’t even yet licensed by the state to operate under the provisions of Prop. 64. Rather, these messages are being used as a means to “build the brand,” but the state rules aren’t in place yet. In order to pass as an amendment to Proposition 64, AB 64 will need two-thirds favorable vote. Also contained in the proposal are guidelines that would help kick-start the process of licensing legal marijuana delivery, which as of right now is almost completely unregulated. Although the statute doesn’t explicitly refer to marijuana deliveries, it does allow for two different types of licenses for distributors of marijuana: One for storefront operations and one for nonstorefront operations. The first would involve retail providers who sell to customers who walk into a brick-and-mortar establishment. The second would involve those locations that have a fixed premises, but don’t welcome direct access by the public (in other words, a delivery service). These nonstorefront marijuana dispensaries may operate in packing centers or warehouses and be allowed to apply for status as a “dispensary,” and from there could operate a delivery system that would adhere to the track-and-trace model that would be overseen by state regulators. Delivery services, though, would additionally need to obtain licenses from the cities where their facilities were located.